There are hundreds of blogs about the European Union and EU politics. So how do you make a start reading them? It’s no easy task. But today things just became a whole lot easier with the launch of BloggingPortal.eu – the new and easy way to follow blogs about the EU. What’s the idea? Essentially we aggregate the content of 278 blogs about the EU in all European languages and all that content is available on the ‘Posts’ page of the site. But that’s no good in itself – we want the good content to gain pride of place on the site. So a team of diligent editors flags up this good content, and this appears as the ‘Editors’ Picks’ on the homepage of the site. So if you go to BloggingPortal once a day you’ll get the most interesting articles from the EU blogosphere, and you can also choose your language preferences in the top right of the screen. So who is behind it? Essentially it was my idea from this post back in September 2007. I managed to persuade Stefan Happer to do all the programming for it, as if he hasn’t got enough on his plate with Politik Portal. Kosmopolit and Bente have also helped out. We’re still in beta version at the moment, and we are also looking for some more editorial volunteers – contact me if you’re interested. None of us have received a cent of payment for any of this. The site runs on a server that I hire. There is no large Brussels media business backing us, and we’re not in any way tied to any sponsors because, well, we don’t have any. We’re also not just ‘pro-EU’ – we won’t include posts if you just think the EU is some sort of conspiracy but we welcome a critical perspective. The site is also about aggregating blogs that already exist, so we don’t presently offer people the possibility to write their own blogs at BloggingPortal. If there’s demand that might be added later. Also for all the news about the project you can follow us on Twitter @bloggingportal. Labour’s World Cup blogs – but what about politics? 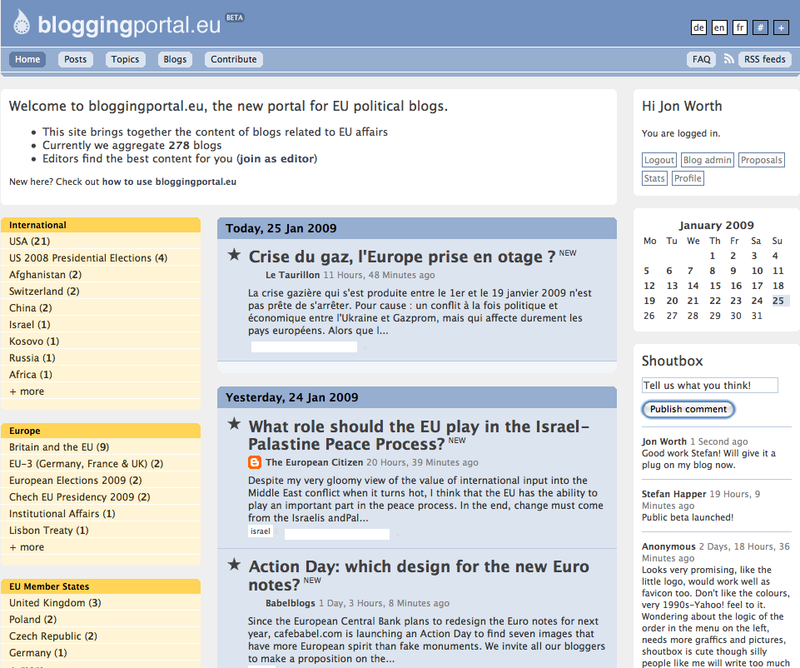 Pingback: Brussels Blogger » Blog Archive » Bloggingportal.eu needs your help! It’s a bit “dodgy” to my mind to arrogate to yourself the right to choose which “critical perspectives” to publish. The site looks great. It’ll be very useful. Congratulations. Excellent work ! Congratulations to all the team. I am buzzing this right now. The looks and the number of blogs are impressive. Congratulations! A very interesting web-app and web-site, a very good job! We collect as a group addresses on Diigo and then I built an app for aggregating a subgroup of them (the set of Italian democratic circles). The last version of the app was written in php with the use of CakePHP framework and SimplePie library (a very early version was built using wordpress and a plug-in). I was thinking to add something as that also in my app since the very beginning even if I didn’t actually did because of lacking of time, I think it could be not so difficult, even if it depends on what kind of people you want to allow to vote: i.e. only people who subscribed the site or even anonymous ones (in this case you need to allow only one vote per IP). Well, the development was hard but also fun. Looking forward to everyone’s feedback. I am glad that we can offer this on a non-commercial basis. Anything else probably wouldn’t work anyway. BTW: http://politikportal.eu will also get a redesign and more features soon.